I've said it once before and I'll admit it again... I used to hate gin. However, there are a few gin cocktails recipes that helped change my mind. 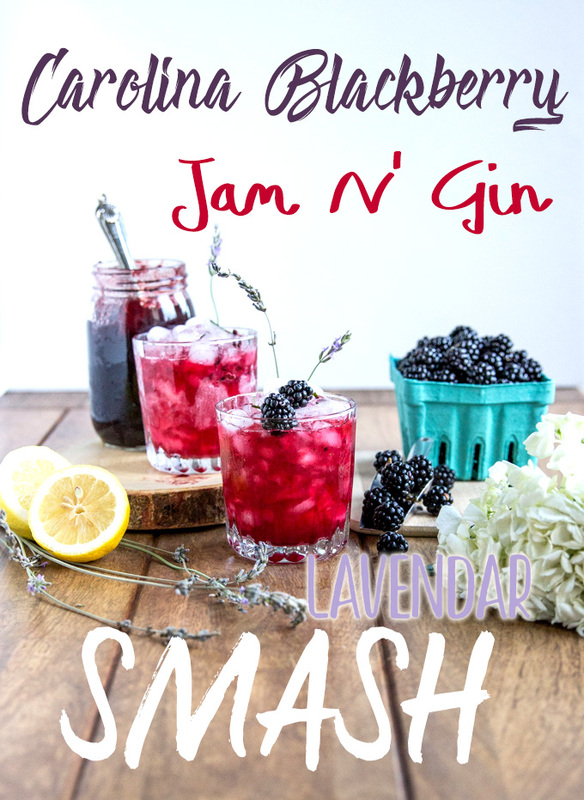 I think gin is the most perfectly suited spirit to make lovely drinks like my French 75 and now, this Carolina Blackberry Jam N' Gin with Lavender Smash. It's got just the right amount of sweetness from the blackberry jam balanced with the tang of lemon juice along with a little bite of gin and a floral finish of lavender. 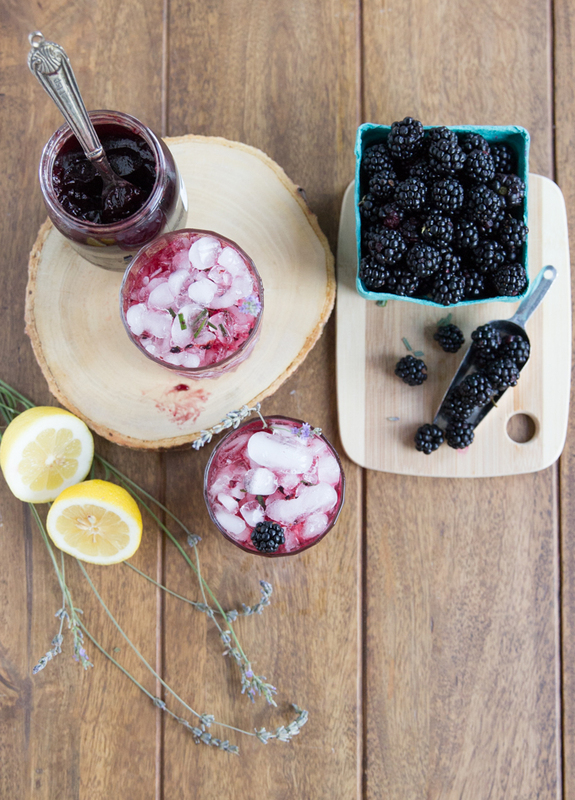 It's the perfect drink for your southern summer soirees to highlight the beautiful Carolina blackberries in season. There are only 5 ingredients in this drink that are all very easy to find at your local market. This gin cocktail is SUCH a pretty drink with it's deep red color and garnish of dark blue blackberries. It makes a ridiculously 'grammable subject for your weekend pics. ;) This recipe isn't just known for it's looks, but it's so yummy your friends will be requesting this to be your signature drink of the summer. What exactly is a "smash" ? Now, can we have a quick chat about what exactly a "smash" cocktail is? I feel like I see this word all the time on long beautiful Pinterest recipe pins and in recipe books I've come across. I did a little research, and found that a smash is basically any take on a Mint Julep. The elements of a smash include: a spirit (any spirit), seasonal fruit, some type of herb, sweetener, and ice/water or a combination. You muddle all ingredients together and shake with ice and then pour over more ice or you can strain out the ice entirely. There's also the option to garnish with the fruit you used or leave it out, entirely up to you, the home bartender. The smash is highly customizable and basically impossible to mess up, which is something the Cheers Years LOVES. So now you know what makes a "smash", a smash. Anything goes! For my take on a smash, I wanted to simplify the ingredients as much as possible but get a really dynamite flavor. So, I used gin with a local blackberry jam made here in NC to incorporate both fruit and sweetness. I knew I'd need to balance out the sweetness and sharp zing of gin with a bit of citrus (lemon) but I also wanted to add a familiar yet unexpected floral note of lavender. Turns out that lavender and blackberries make one heavenly combo. I just love that this drink tastes like a southern sip with the blackberries but has a refined edge of the lavender. Eeek, I can't wait for you to try it! About the gin I used... I recently discovered that we have a some fantastic gins produced locally in the piedmont area of North Carolina. Although I hadn't tried it before, I took a leap of faith and purchased Top of the Hill Distillery's gin and good news - it was fantastic. I love supporting local products as much as possible. I can happily say that every component of this drink was made with local ingredients. Woot woot! Measure gin, fresh lavender, lemon juice, blackberry jam (or preserves), and a couple of fresh blackberries in a shaker. Muddle them together for about 10 seconds. [NOTE: be careful when first muddling blackberries, they have been known to explode blackberry juice all over clean shirts.] Then, fill the shaker halfway with ice cubes and shake for 10-12 seconds. From there, strain over shaved-ice filled rocks glasses. You can garnish with a few sprigs of fresh lavender if you have (or bought) an entire lavender plant and/or a few fresh blackberries. That's it m'dear! I hope you give this one a try and love it as much as we do! Here's to local ingredients that make tasty recipes even tastier... Cheers! A sweet, tangy, and floral summertime sip of the south! Combine jam, optional blackberries, lemon juice, gin, and minced lavender in a shaker. Muddle all ingredients together about 10 seconds until well combined. Fill shaker halfway with ice, add topper and shake for about 10 seconds. Pour strained liquid into saved or crushed ice-filled rocks glasses. Option to garnish with a few fresh lavender sprigs or blackberries.